Video Art Festival Miden invites all video artists and video creators to participate in this yearʼs 9th edition of the festival. The Call for Entries for 2013 has been opened! The festival is open to every creator (individuals, groups or organizations) of any nationality and background. Submitted works should be under 10 minutes in duration. 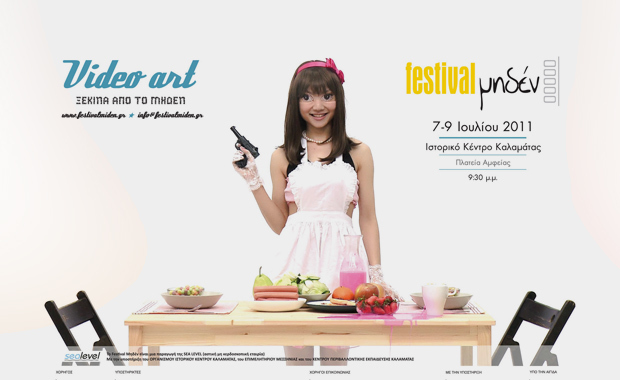 Festival Miden 2013 is scheduled to take place in Kalamata, Greece, in July 2013. Additional screenings and events will be organized in Kalamata, Athens and other cities/countries after July. we also invite artists and creators who come from, have lived or have any kind of love-hate relationship with the city Kalamata (GR) to submit works for the continuous program entitled “Local Calling!”. The program aims to create a communication network between artists that are connected or related to Kalamata (the birth city of the festival) in any way. Selected works will become part of the 2013 Miden Festival’s program. For more details and guidelines for submitting, please visit the official website.